Well the festival is now over and I couldn’t feel more satisfied or inspired. The closing day was like a fairy tale. I showed up at 9:30 a.m. and saw 6 of Samarji’s students perform in a tabla ensemble. 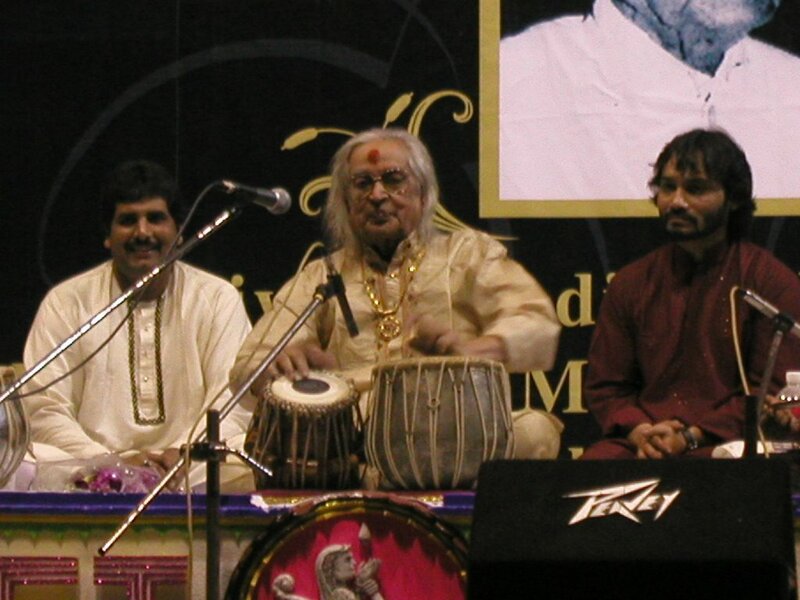 They were all really good and I wouldn’t be surprised if a few of them became tabla masters themselves. 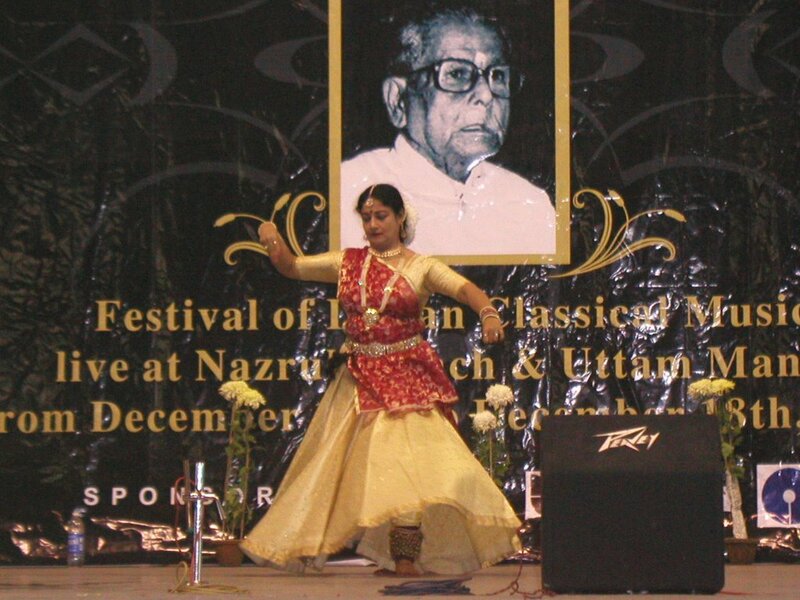 They were followed by a Kathak dancer that went on for almost 2 hours. She seemed to have endless energy. I was feeling so much anticipation for the arrival of Swapan Chaudhuri that I could barely pay attention. After the dancer there was to be one more singer and then Swapanji was up. George said I can meet him before the performance if I want, but as of the end of the kathak dance he had still not arrived. The singer was Manas Chakrabarty. He seemed to be very well known and very well liked by the crowd. People were packing into the seats, which got me worried that I would loose mine if I left to see Swapan. The singer was accompanied by Kumar Bose on tabla. Up to that point in the festival, I would say that he was my favorite soloist. He was just as great to watch accompany as well. As the singer went into his final piece, I decided that I did not want to miss the opportunity to say hi to Swapan before he went on. I asked Manu to save my seat and went backstage. I saw Samarji and asked if I could meet Swapan. He immediately pointed me to his room and I went back. It was full of people, all wanting to say hi. I scooted up to the front and just sat down in front of him, (he had been warming up for the performance). He recognized me right away, but didn’t remember my name right off. 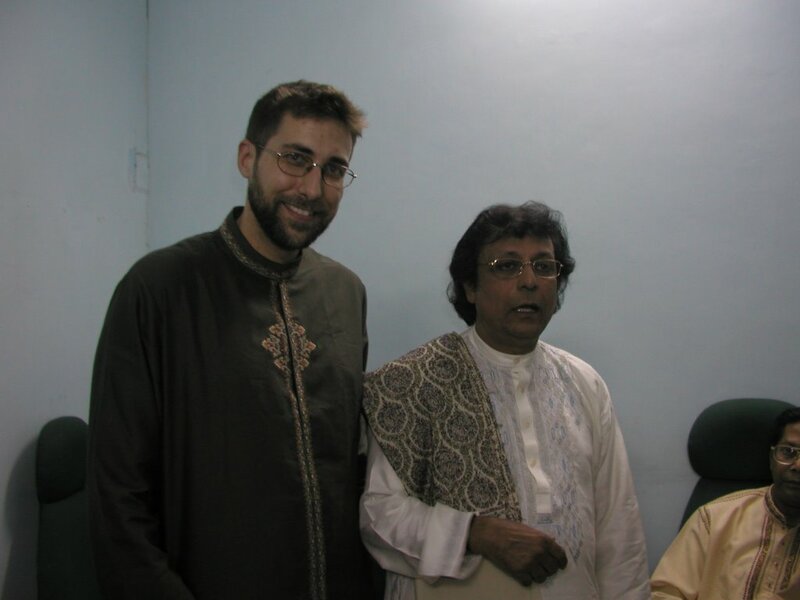 I told him that he was my first tabla teacher and that I have been inspired by the instrument ever since in large part because of his teaching. It looked like a light went on and he remembered me all of a sudden. We talked about Calarts and some of the people there. He said he is now the chairman of the music department. I told him I was very happy to be able to watch him play and touched his feet. I stood up to get out of the way and a couple people came up to me to ask about people I knew from Calarts. They had come with Swapan and knew some of my old teachers and friends. I passed my card around and felt so satisfied that I went backstage. Now it was time to rush back up front to claim my seat back and get ready for the show. When I started learning tabla, everyone at the school always told me the stories of Swapan’s playing, and how he is so well known and respected for his beautiful sound and masterful technique. 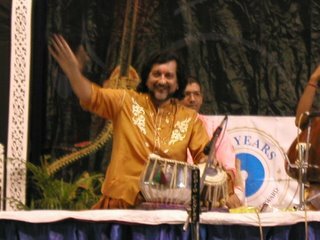 Since I never actually got to see him perform a tabla solo, I never got to see for myself what everyone was so excited about. I think that made him a mythical legend in my mind. Actually seeing this legend on stage in front of me was sort of like watching a superhero take flight. The setting was perfect, the sun was just right so it poured a soft amber light over the audience. I could feel the warmth on my face. The stage was lit in bright white light, untouched by the amber sun. The contrast of light was as though the performer and audience were existing in two different realities. I felt so happy watching this master at work. His playing was beautiful and amazing. 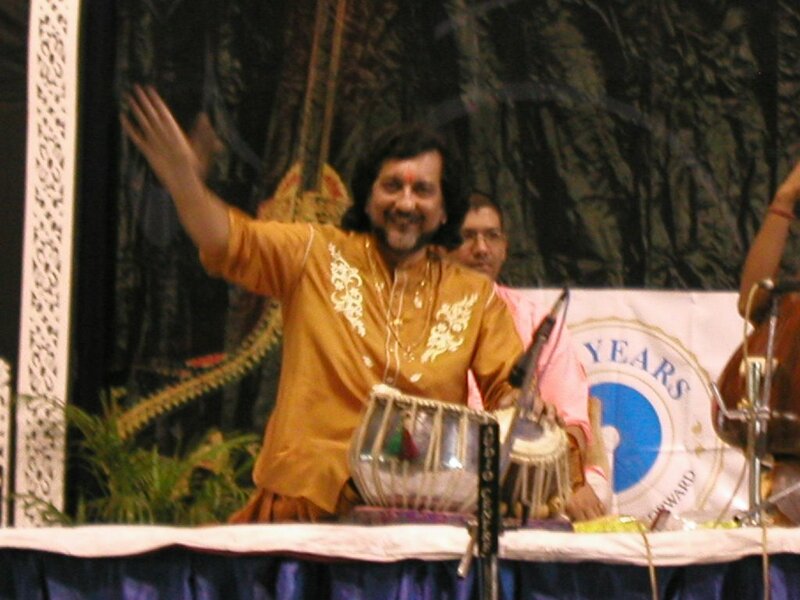 I was surprised to be able to recognize some of the things he played because they were some of the first compositions I learned on the tabla. I felt like I had come full circle. Swapan finished his last composition and thanked the crowd, but just as he was about to get up Shankar Ghosh walked in. He held up his hand and said something to the effect of, ‘I just got here, you can’t be done yet, you must play something for me.’ Swapan laughed and sat back down. 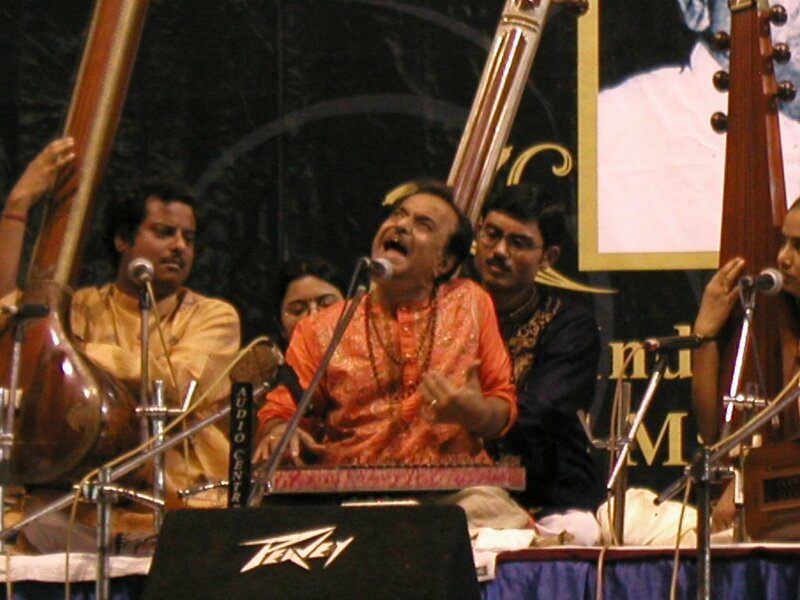 It was a great show of respect that not only allowed me and the rest of the crowd to see one more composition, but connected the reality of the rest of the festival to this almost surreal experience of seeing my old guruji perform. When he was done I rushed backstage again to try and snag some pictures. The crowd around him was intense. People were pushing each other just for a chance to touch his feet. When he got to the dressing room they let about 10 people in and cut everyone else off. I was able to get in because a few of the crew wanted me to take pictures of them with Swapan. I snapped a few pictures and Swapan asked how long I will be in India. I told him just 2 more days and he said, “Well, I guess I will see you in America then.” I shook his hand and went outside. For the next hour I just stood outside in a dazed state. Just taking everything in and processing what had just happened. After a while, I realized that there was still music playing, so I went in to enjoy the finale of the festival. 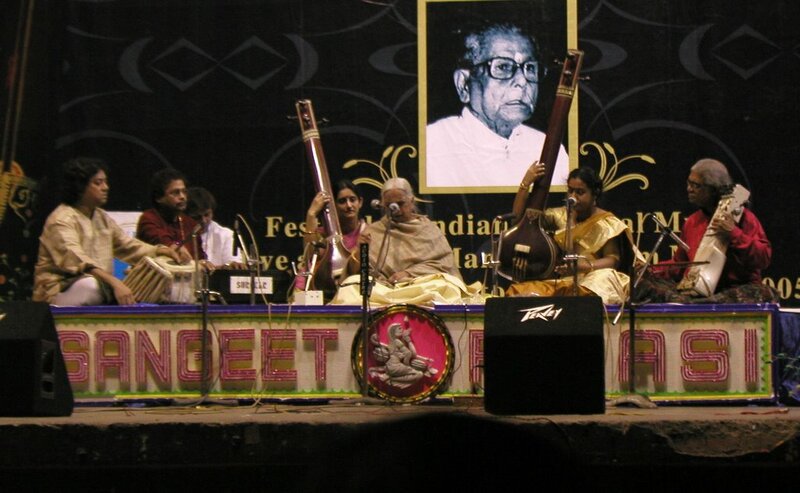 I caught the end of a sitarist named Budhaditya Mukherjee, which was great, but my mind was still elsewhere. The final two performances were by two of the oldest living exponents of Indian Classical music. The first was a vocalist named Smt. Girija Devi. When she took the stage she said that a couple of months ago she had double bypass surgery on her heart. She said that she did not think she would ever be able to perform again. Tonight she would sing Rag Yemen. It was the simplest rag she sang, and it was the rag she teaches to the smallest children. She wanted to sing it tonight because with this performance, she feels as if she has been born again. Her singing was amazing and powerful and still very much full of life. The final performance was by Pt. 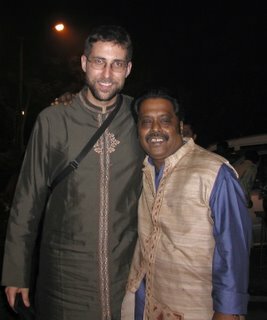 Kishen Maharaj and his son Puran Maharaj. 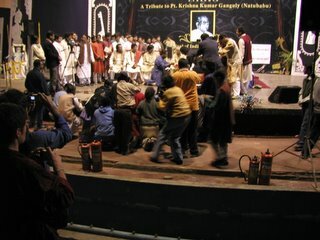 When he came onto stage everyone in the crowd stood up and there was a 20 minute devotional ceremony, known as a puja. 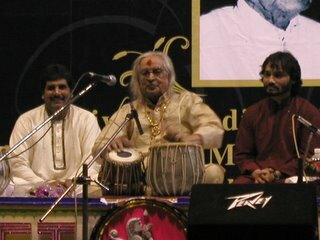 All the great tabla masters from throughout the week were on stage to touch the feet of this master. 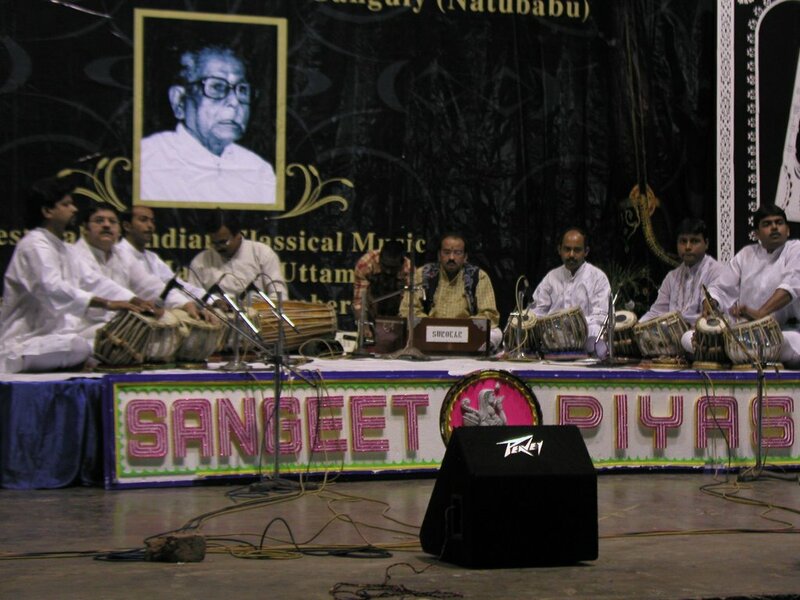 Actually there were more than just the tabla masters. All the singers and instrumentalists were up there as well, along with children, students, and any others that just wanted to show their respect. Pt. Mahraj gave a 10 minute speech and then sat to play his drums in what may very well be his last public performance. His 88 year old hands were shaky and slow, but his rhythm and improvisational mind were as sharp as ever. The seats were packed. 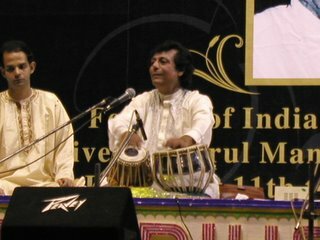 I was sitting behind and next to all the great tabla masters as they watched this living legend. They were all on the front of their seats just soaking the moment in. I was awe struck by the moment and felt so happy to be able to be a part of it. When the concert was over I hung around a bit and saw Samarji. He was beaming with the biggest smile I have seen from him all week. I congratulated him on an amazing festival and told him that I have been truly inspired by his effort. I said goodbye to my new friends and slowly walked back to my room. It was a good day. John, these are great entries. I hope you were able to make audio of some of this!! !